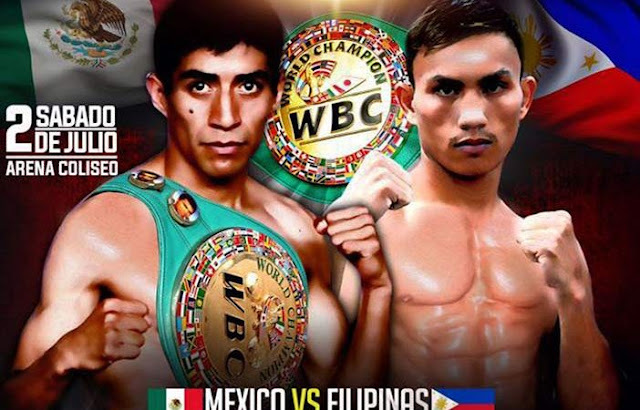 Mexican WBC world light flyweight champion Ganigan Lopez will face a tough Filipino boxer Jonathan Taconing of the Philippines on July 2, 2016 at Arena Coliseo, Mexico City, Distrito Federal. Ganigan a 34 years old boxer with the record of 27 wins 17 by KO and has 6 defeats will defend his title against tough Filipino. Lopez will defend his title for the first time after winning it via Majority Decision against Yu Kimura of Japan last March 2016. The Mexican boxer is a hardhitting and known on his relentless attack. Not too fast but not too slow either. He had some problem fighting one Filipino in the past when Denver Cuello of the Philippines knocking him out in his hometown in 2012. Cuello defeated him via 2nd round knockout. On the otherhand, the Filipino challenger is a 29 years old boxer from Siocon, Zamboanga Del Norte, Philippines. He has a record consisting of 22 wins including 18 big victories by way of KO and has only 2 defeats. Taconing once visit Mexico to face Ramon Garcia Hirales and he defeated the Mexican via stunning 10-round KO. It was the best fight so far for Taconing. He is the current OPBF light flyweight champion after beating the fellow Filipino boxer Jomar Fajardo last year. From now, the Philippines has 3 world champions, Donnie Nietes, Nonito Donaire and Johnriel Casimero.